A friend of mine was having a baby. Her second baby. 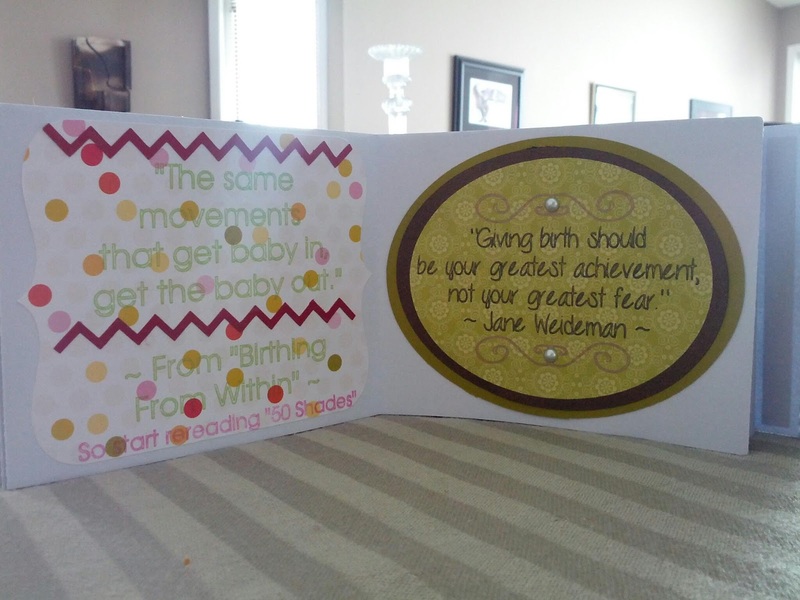 And instead of the traditional baby shower, she was having a blessingway. I was completely unfamiliar with blessingways, so I had to do some reading in order to understand what I would be participating in. Each guest was asked to bring a snack to share and a candle for her to light during her birth. OK, I could handle that. No problem. My problem was what to bring as a gift. I scoured the internet for ideas of what would make a good gift for a blessingway. There was, surprisingly, a lack of ideas on the internet. 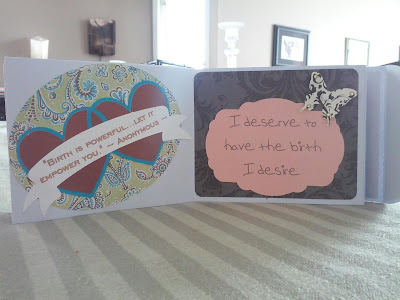 It wasn't until I came across some forum where a woman asked for birthing quotes for a journal that she was making for a blessingway gift that I knew I had my idea. There were two conditions that I had for this particular gift. One, I wanted it to be homemade by me. This particular friend is the type of friend who not only appreciates the effort that goes into homemade gifts, but would usually prefer something homemade over something store-bought anyway. And I love making homemade gifts. The second condition was that I wanted to use my Silhouette Cameo to make it. I had just bought a Cameo after Christmas with the money I had received as a gift. I was still trying to get used to using it. 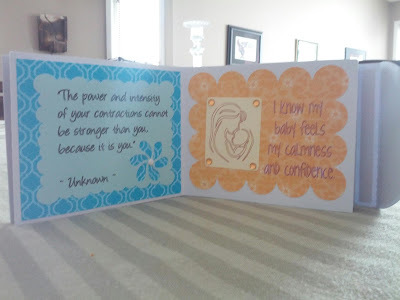 So I decided to make a homemade book filled with quotes and positive affirmations about giving birth. And the goal was to use my Cameo to make it. 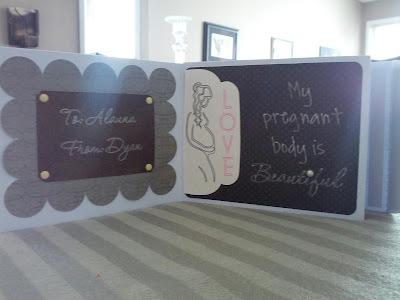 I knew it was going to be the perfect gift since my friend was feeling nervous about the upcoming birth. 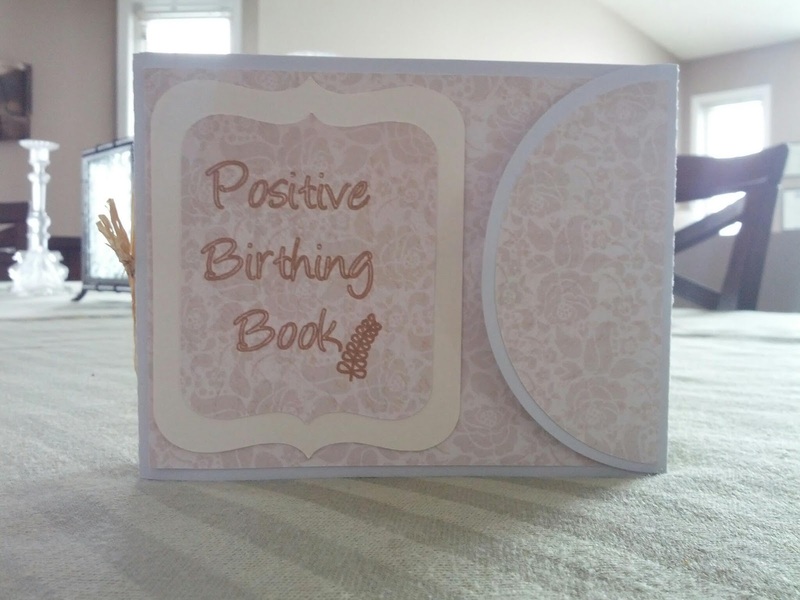 She had had a difficult and traumatic first birth and really needed the support and encouragement. She needed to be reminded that this birth would be different and could be a positive experience. And I was hoping that my gift would be helpful in reminding her of these things. And if not, at least it would be a beautiful keepsake. I purchased this shape and this shape from the Silhouette online shop with the $10 gift card that I had received when I bought my Cameo. Then I was ready to go! 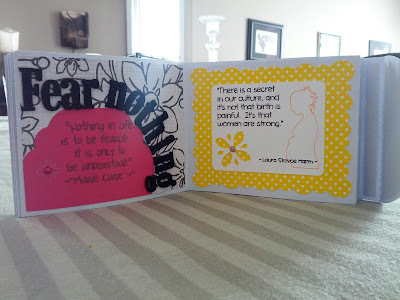 I had so much fun creating this book and I absolutely LOVE how it turned out! The cover features a velcro closure and a raffia bow on the spine. Sparkly brads and a little pearl were used to embellish the pages below. 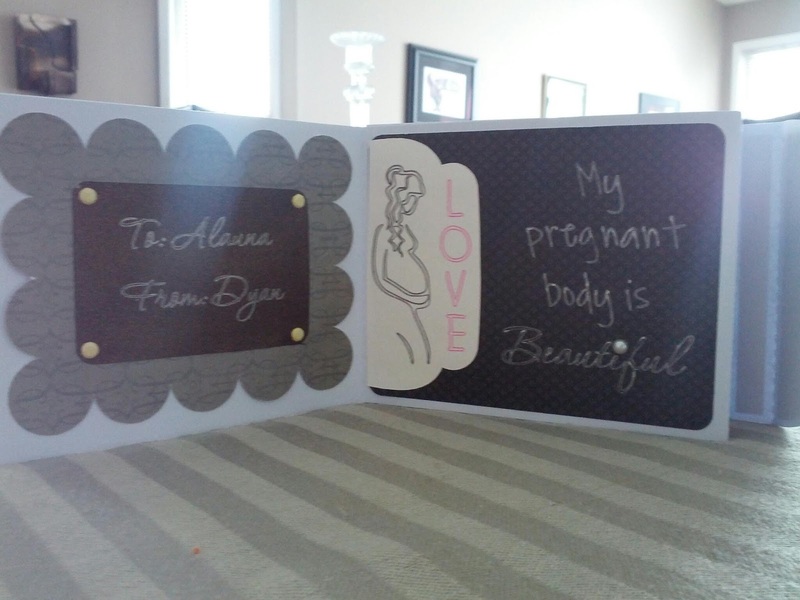 I particularly love the sketch of the pregnant lady. I really love these next pages. The picture doesn't do it justice. Clearly, I should use my actual camera instead of my smartphone to take pictures. Oh well, this was taken before I started blogging. My friend joked that her baby was a "50 Shades" baby since she became pregnant shortly after finishing the 50 Shades trilogy. These next two pages are my favorite. I think they turned out absolutely beautiful. At the back of the book there is a page for her to write her own positive affirmations and a page with my personalized blessing. I attended the blessingway at the beginning of February and it was a great experience to take part in. You could just feel the love and support oozing from every single woman that attended. It was amazing to be part of it all. And I think my gift was well received. J has recently learned how to work a computer mouse, so he was responsible for clicking the "cut" button when it was time to cut out shapes with the Cameo. Or clicking anything else that I may have needed. Both J and K took turns turning the Cameo on and off, probably about twice as many times as I had asked and/or would have liked. Probably 75% of the text for the book was typed out by J. I dictated and he typed. As an aside, it's funny to read any book together now since he will often say "space" when he sees the space between the words. J also helped with a lot of the gluing and loading the paper into the Cameo to be cut or drawn on. K spent a lot of time rearranging my craft supplies, making it difficult to locate things I needed. That was his primary mode of "helping." K also loved playing with the scraps of paper and cardstock after I cut out the shapes I needed. Sensory play right there what with all the different textures, colors, and designs the paper had to offer. J and K also enjoyed reading through the book with me when it was finished. We had fun pointing out specific letters and colors, describing what words meant, and looking at the pictures that were drawn. 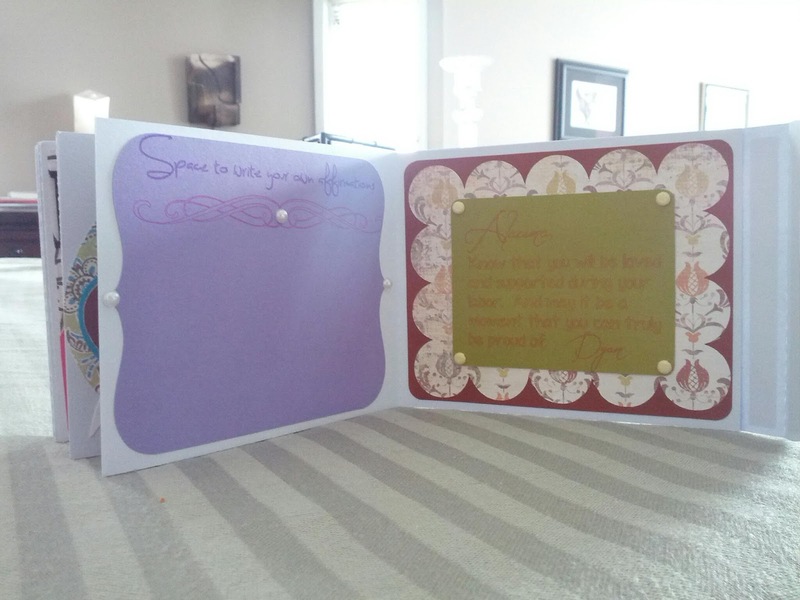 Craft time doesn't have to be just for the kids. It can be something you want to do. You just have to find ways for them to help you out with it.